Ask any parent and they will tell you that the number one priority for them is ensuring they keep their children safe. This is why parents spend hundreds of dollars on high-quality car seats, cribs and safety-proofing equipment for their homes. Safety doesn’t stop once you leave the house, however, and some might say it becomes even more pertinent outside the home. The Spring 2018 update for this article provides the most up-to-date car sun shades available on the market currently. We replaced outdated sun shades with some really cool ones that feature newer technology and more unique hanging systems for your vehicle. Aside from ensuring a safe car or booster seat is installed properly and instilling car safety rules (seatbelts, everyone!) from a young age, many parents overlook another very important vehicle safety component – protection from the sun. There are studies that prove that over half of skin cancers in the United States are found on the left (drivers’) side of the body. The diligent parents who slather their children in sunscreen before going to the park often forget that the sunlight and UV rays can penetrate through windows and will unknowingly leave their children unprotected on long road trips. We believe firmly in sun safety so that is why we have compiled a list of the top ten best car sun shades. Ensuring your vehicle is equipped with proper UV-blocking shades will not only keep the overall temperature of your vehicle comfortable during the summer months, but they’ll help protect you and your children from the damaging rays of the sun. These sun shades from Veneev offer parents peace of mind for a very low price. They feature an impressive UV ray blockage of up to 98% thanks, in part, to the products protective mesh material. No more struggling with inconsistent and annoying suction cups. These shades from Veneev are made with durable nano material for infinite use and won’t leave a gross sticky residue on your windows either if you need to adjust or move them. These sun shades offer SPF 30+ protection which translates to cooler and more comfortable car rides for everyone. Priced quite low, these Veneev brand sun shades are number one on our list for a reason. You will receive four shades in total for one low price. Not having to fumble with annoying suction cups is a definite plus for this product as well. 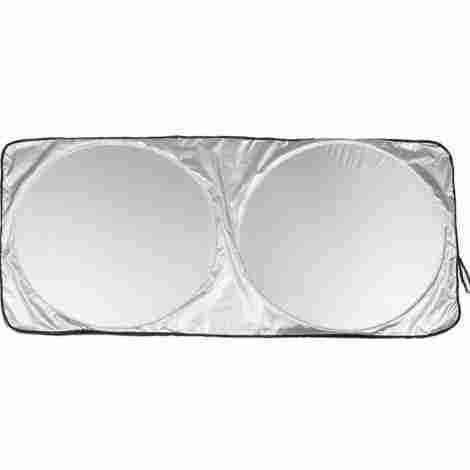 The Enovoe brand sun shade is second on our top ten list for good reason. The shades will block over 97% of the harmful UV rays from the sun, ensuring the driver and all of the vehicle’s passengers are protected from the bright lights and skin irritation that can occur from prolonged sun exposure. The dual layer design featured in these Enovoe brand sun shades is what sets it apart from other options on our top ten list. The mesh side of the sun shade provides protection from the sun, its glare and heat. The back side, made of static cling type of material, makes for easy installation and adjustments if required. Enovoe believe so deeply in their product that they offer their customers a lifetime money-back guarantee on their sun shades. If for some reason you need to return this product, they won’t ask you any questions before refunding your money. They truly stand by their product. Priced similarly to the other options on our top ten list, the Enovoe sun shades are a great choice because you receive three sun shades for one low price. Also included in the listing price are two free gifts - a handy premium pouch for carrying your shades and a free e-book filled with tips for sun and heat safety for children. These shades from ShadeSox came in third on our top ten list. They come in a pack of two and claim to fit 99% of vehicles. These shades are made of a stretchy mesh material that won’t damage your vehicle in any way. Once they are installed properly in your vehicle, these shades from ShadeSox are so light and thin that they aren’t even noticeable on your windows. Knowing this, it seems that ShadeSox may have had to sacrifice protection in order to make such a discreet product but this is not the case. These sun shades not only provide superior UV protection, but they also help to reduce glare from the sun and lower the in-cabin temperature all while preventing your most precious cargo from getting burned or overheated. It seems that there are many sun shades on the market that force consumers to forfeit the ability to open their windows once the sun shade is installed. These shades from ShadeSox do not fall into this category. The ability to roll down the window and feel the summer breeze on your face is still a possibility with these shades. Priced just a bit higher than some of the other options on our top ten list, these ShadeSox brand sun shades are worth the slightly higher investment. A huge selling point for these shades is that you are still able to roll down the window to let in a nice summer breeze if you so feel the need. Many other sun shades don’t offer their customers that luxury. These Kalmore brand sun shades come in a three pack and boast the ability to provide protection from both glaring sunlight and hot temperatures while not impacting the driver’s visibility very much. The shades static cling surface make it easy to install and readjust if necessary. These shades are made with a special material that is not only UV-resistant but also boasts the ability to keep your vehicle cooler and more comfortable thanks to the shades’ 80 GSM protective mesh. This type of material will block over 98% of UV rays while keeping your vehicles temperature low and protecting your passengers from harmful sun rays. These shades from Kalmore firmly cling onto your vehicle’s windows thanks to its Super Static Cling Technology. This technology features a lightweight mesh fabric that will firmly adhere to your windows – no annoying suction cups required. Priced a little lower than most other options on our top ten list, these Kalmore brand sun shades are worth a shot for that reason alone. Pair that with the fact that you actually receive three sun shades in this package, you’re sure to find this price hard to beat. These sun shades from Snug and Safe are UPF Certified 50+, meaning they are able to block up 98% of UV rays from the sun. Blocking out these rays is very important as small children’s eyes are not yet equipped to filter UV light as efficiently as a set of adult eyes. Many sun shades are too dark and obstruct the view for the passengers sitting nearby. These shades from Snug and Safe offer an innovative and semi-transparent design. This means that the shades only block the sun and not the view, ensuring that your passengers are protected from the sun but still able to peer outside. These shades from Snug and Safe offer foolproof installation. They peel off easily when not required and can be stored in the bonus storage pouch you will receive when you order your shades. Priced a bit lower than other options on our top ten list, we highly recommend the Snug and Safe brand shades for a few reasons. First of all, it’s a risk-free decision to purchase these shades as this brand stands behind their product so much that they offer a 100% money-back guarantee if you are displeased with your item. Secondly, these shades offer the highest UPF protection (50+) than other options on our list. This whimsical sun shade from Fast Mile will become a fast favorite for the little one in your family with its adorable puppy design and is sure to be a hit with you as a parent thanks to its superior protection from the sun. Fast Mile boasts a 35% thicker sun shade than other options on the market. This is due in part to the thick and durable mesh material that they’ve chosen to use in the sun shade construction. Fast Mile boosted their sun shade protection by opting for 110G mesh material. Thanks to its special material, these sun shades don’t require the use of bulky suction cups that leave unsightly marks on your windows. These shades won’t leave behind scratches or marks in your windows, even if you already have tint on them. This pack of two sun shades from Fast Mile are priced a bit higher than the average of other options on our list. But you can expect to pay a touch more for a product using higher quality materials. This is the only option on our top ten list that uses 110G mesh material, offering a bit more protection for your passengers. These sun shades from Jomolly are created with children in mind. 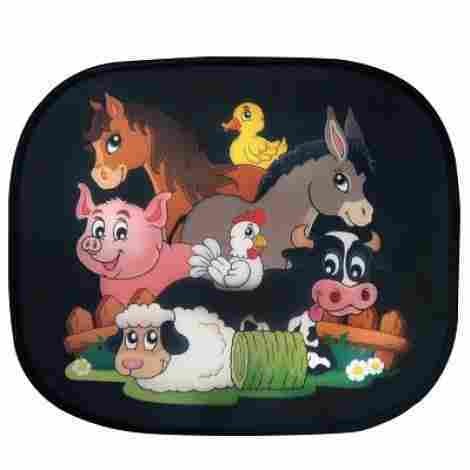 The shades themselves are covered in a cute kid-friendly farm animal design sure to catch the eye of your little one. Some reviews on other sun shades complain that the shades won’t stick in the windows of vehicles in colder climates. These shades from Jomolly are meant to be used on both cold and warm days! These shades come with four suction cups that you affix to the window. The cups don’t come attached to the shade. It is up to you where to place them. This makes for a customizable fit to your vehicle and your needs. Priced similarly to other options on our top ten list, what sets the Jomolly brand apart from others is that these shades require suction cups and don’t rely on static cling. This can be seen as a pro or a con, depending on what your needs are and how your vehicle responds to suction cups. These shades from Zataye are as compact as they are protective. They come with a free travel pouch for storage and claim to block up to 98% of the damaging rays from the sun! These shades from Zataye are made of lightweight material that is very durable. It features a sturdy wire around the shade to help boost performance. With the Zataye brand sun shades you actually will receive four sun shades. Two of them are 20” x 12” and the other two are 17” x 14” in size. This is the only option on our top ten list where you receive four shades! Priced at the same price point as many of the options on our top ten list, what sets the Zataye brand shades apart from others on the list is that you receive four sun shades instead of just two or three like many of our other items. These shades from Punada are a little different from other options on our top ten list. They feature a roll down shade instead of a static cling design. They are durable and made to last for years. The Punada shades claim to block 98% of the sun’s harmful UV rays, offering superior protection from both UVA and UVB. These shades have two different installation techniques. You can choose to clip them to your windows with the hook found on the shade. Or you can use the shades three suction cup system to attach it to your window that way. No finicky static cling required. Priced just a bit higher than other options on our top ten list, the sun shades from Punada are a great addition to your sun protection regimen if you have had issues with static cling shades in the past and want to try a roll-down system instead. They’re also great for vehicles with different sized windows as you can choose how long you want the shade to be. These sun shades from Cozy Greens are as durable in construction as they are protective against harmful sun rays. They’re made of a heavy duty wire frame to help extend their life while still maintaining a light weighted feel to them. These sun shades from Cozy Greens are made with UV-GuardMesh™ material. This features a double layer of UPF (Ultraviolt Protection Factor) to providet he most protection from the very harmful ultraviolet rays of the sun. As a bonus, this type of material won’t impede your vision while you’re driving. Cozy Greens really pulled out all the stops with this product. It blocks out 98% of the sun’s UV rays in order to protect your child from the sun’s heat and glare. The mesh fabric is put together in a double layer and is certified UPF 50+, exceeding industry standards in sun protection. These shades from Cozy Greens are an affordable option to add to your repertoire. They are one of the cheaper options on our top ten list as well as one of the most durable so parents are sure to love that feature. When it comes to products that are marketed towards parents with babies, there are endless options available. Some are just for fun, some are completely ridiculous, and some are absolute necessities. One thing that seems to often go unthought of, but should most certainly be considered as one of those very necessary products when you have a baby is a sun shade for your car. What Exactly is a Car Sun Shade? A car sun shade may be known by many different names including car shade, sun screen, UV shield, sun shield, heat shield, car shield, and car screen. It is essentially a sheet of various materials that goes onto your car’s windshield or your car’s windows with the purpose of blocking the sun and preventing potentially harmful UV rays from reaching the interior of your car. Sun shades can be very beneficial, so it’s a great idea to have them for every window and windshield of your car even if you don’t have any kids. However, they become essential if you do have a baby. You specifically want to have a sun shade on the window nearest to your baby when your baby is in your car. In addition to being very beneficial, car sun shades are typically very simple and easy to use. Different car sun shades may install in different ways, especially depending on where they are designed to go inside your car. 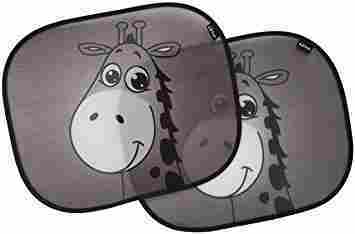 Many car sun shades that are designed specifically with baby in mind attach to the windows of your car via suction cups. Some that are designed for the windshield may simply be placed in the windshield, sometimes with instructions to open the car’s visors to hold the car sun shield in place in the windshield. When a vehicle is left without any protection from the sun, there can be harmful effects. The sun rays go into the vehicle through windows and windshields and bounce around. This creates a greenhouse effect where the sun comes into the vehicle and heats it up but then the heat is trapped inside of the vehicle causing temperatures to be much higher inside the vehicle than outside the vehicle. This can make entering a vehicle uncomfortable and inconvenient. The consistent exposure to the sun can also cause damage to the interior of the car over time. Having sun shades throughout your car can have many benefits no matter what. However, if you have a baby in the car, you will find that car sun shades have even more valuable benefits. 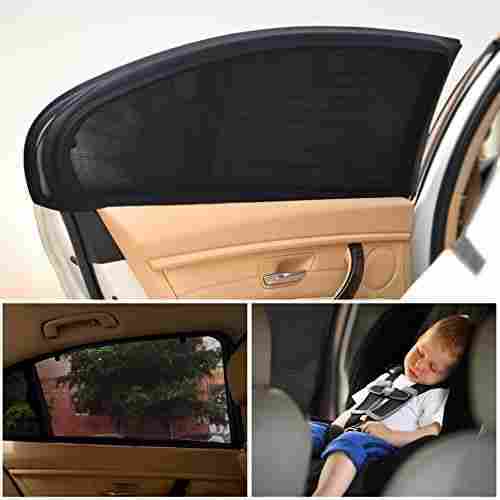 Car sun shades help your baby to stay cool and comfortable. By blocking the sun from entering the car, car sun shades help to prevent the greenhouse effect from occurring in the vehicle. Thanks to this, the car will stay cooler than it would otherwise. The car staying cool is vital to your baby’s well-being. Not only is it a matter of comfort, but when a baby overheats, it puts their health at risk as well including raising their chance of dehydration, heat stroke and even SIDS, or Sudden Infant Death Syndrome. In addition to helping keep the temperature of your car down and protecting your baby from potentially overheating, car sun shades also protect your baby from acquiring a painful sunburn. They do this by blocking not only the light and heat of the sun but also preventing potentially dangerous and harmful UV rays from penetrating the vehicle. Over exposure to the sun can cause your baby to get a sunburn. Babies have particularly sensitive skin compared to adults and are more likely to get a sun burn more quickly than we would. Sun burns can also be worse for babies because babies aren’t able to understand what’s happening and are less able to deal with pain than we are. In addition to the damage that the sun’s rays can potentially cause to your baby’s skin, they also pose a threat to your baby’s delicate eyes. The more that our eyes or our babies’ eyes are exposed to direct sunlight, the more damage that they take on. Eventually this can lead to decreased range and clarity of eyesight. Protect your baby’s eyes while in the car by using car sun shades on your windows, especially use them on the window’s next to your baby’s car seat. Most babies are not big fans of being in the car. There are plenty of things you can do to try to help this and one of the most important things you can do to help your baby enjoy the car better is to keep them as comfortable as possible while in the car. Using car sun shades can help increase the comfort level of your baby in the car by keeping it cool and by protecting their skin and their eyes from potential burns and damage. In addition, it prevents annoying glares. The sun in the car may force your baby to have to squint their eyes to see around them which can be upsetting for a baby. Your baby likely wants to be able to look around and study their surroundings freely. This can help calm your baby and keep them content and relaxed. 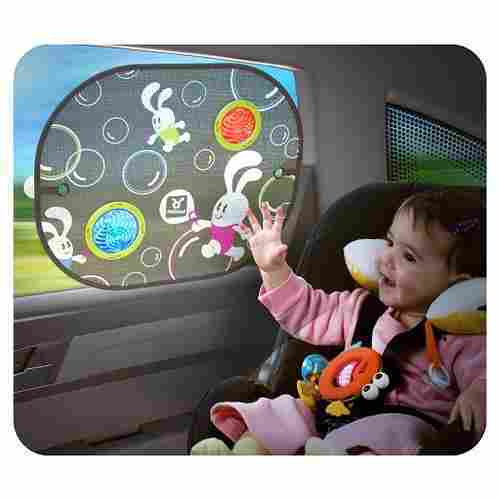 You can allow your baby to more easily study their surroundings by using car sun shades. Overtime, exposure to the bright rays of the sun, specifically the UV rays that the sun produces, can cause damage and wear on not only your vehicle’s seats but also on your baby’s car seat. The exposure to these sun rays can eventually cause fading and eventually can even damage the integrity of the materials in your baby’s car seat as well as your vehicle seats. Protecting our little ones takes the upmost priority and importance in our lives. One thing that may be sometimes overlooked but is exceedingly important is protecting our babies from the sun while in our cars. Exposure to sun in the car can cause many problems for baby that can easily be avoided by simply using car sun shades. Their ease of use and the fact that most all of them are fairly affordable takes away any excuses we might have to not take advantage of this valuable tool to help protect and increase the comfort of our sweet babies. Having a baby makes having a car sun shade a necessity as baby’s safety and comfort should always come first. When choosing which car sun shades are right for you, there are several important factors that you should take into consideration. Different car sun shades install in different ways. 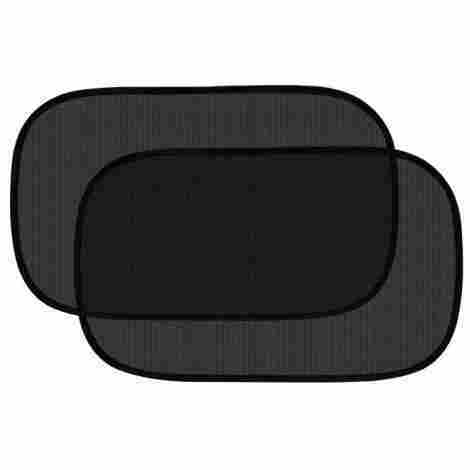 How the sun shade installs should definitely help you to decide which car sun shade is for you. You want to consider which way of installation will work best for you and which one you find most convenient. Some car sun shades are cling-on style and simply cling to the window. Another way that some car sun shades install is similar to vinyl stickers. These are usually cut to the same size as your specific car window. Probably the most common way that car sun shades install is by using suction cups attached to the car sun shade to stick it onto the window. 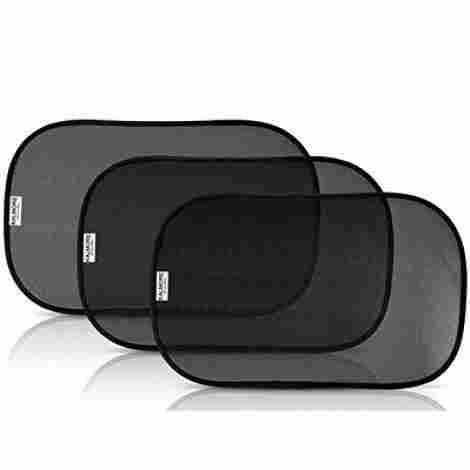 Car sun shades come in all different sizes and shapes, so you definitely want to think about how much coverage the car sun shade needs to provide to meet your needs. Some people find that a smaller shade does the trick just fine, while some people feel like a car sun shade that provides full coverage is essential. To get a car sun shade that provides full coverage, you’ll need one that is designed for you to measure it and cut it to fit onto your window perfectly. 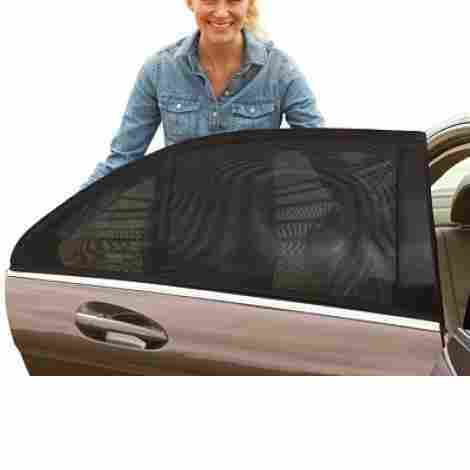 Other car sun shades may provide more or less coverage from the sun depending on the size of the shade compared to the size of the window you place it in. Measure your windows and compare that to the size of different car sun shades until you find one that you feel will provide an adequate amount of coverage for you. 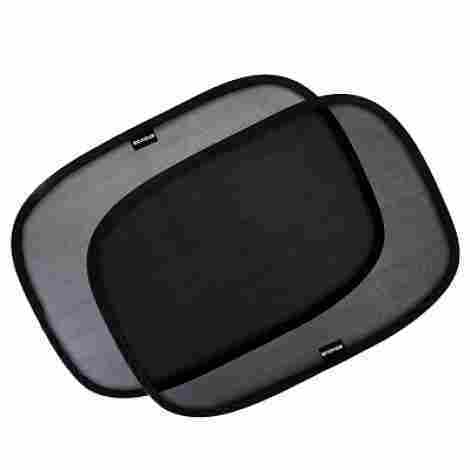 Another consideration that you’ll want to take about your car sun shade is if it’s retractable or not. 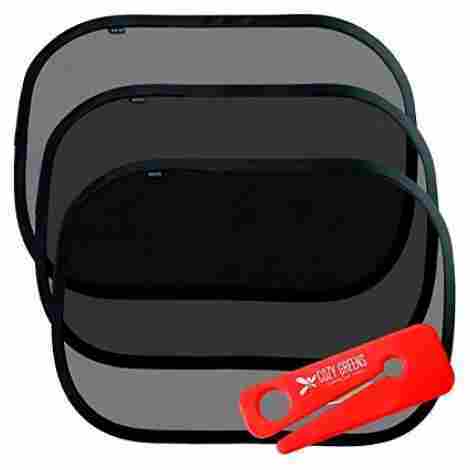 Some car sun shades have the option to retract up into a tube that you attach to your window usually by suction cups. You may find that you sometimes want to be able to more clearly see through your window without the car sun shade in the way. The retractable car sun shades allow you to easily do this without having to take the car sun shade off of the window at all. Will It Fit Well Where You Want It? 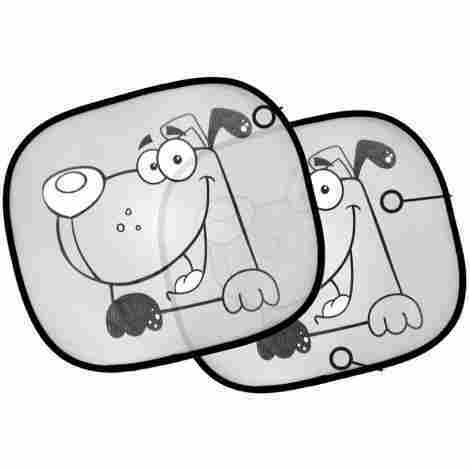 Car sun shades, just like cars themselves, come in all different shapes and sizes. This means that, obviously, not all car sun shades will work well for your specific vehicle. Some car sun shades may be so small compared to your windows that they don’t provide adequate coverage. On the other hand, if you have particularly small vehicle windows, you may find that some car sun shades are too large and won’t fit on your car’s windows at all. 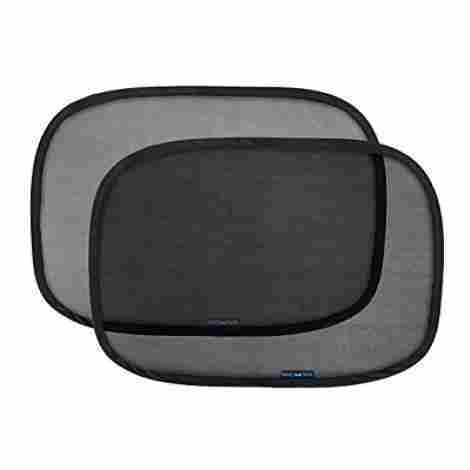 The car sun shades that are designed to be cut by you to the perfect size and shape for your window will, of course, fit on any car window perfectly. The appearance of the car sun shades that you choose may also be important to you. Most car sun shades are plain without any type of design. This might be good if you’re hoping it will blend in more and not be as noticeable or eye-catching. If you’re looking for something a little more fun, or perhaps something that your child will really love, you can consider choosing a car sun shade that has some sort of design on it. There are many car sun shades that provide plenty of fun and colorful options. Designs could range from adorable zebras frolicking along to elegant swirls. Obviously, with any purchase that you make, you’ll want to consider the price of the product first. The range of price for car sun shades is fairly large. Some are extremely affordable, while others are a bit more pricey. There should be plenty of options available for a budget of any size, though. You may be tempted to choose the cheapest option you find, but consider more than just price. 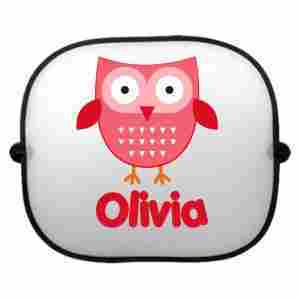 You want to make sure that whatever car sun shade you choose has a great value and not just a cheap price. Look for something affordable that fits as many of your other preferences for a car sun shade as possible too. Last, but certainly not least, you’ll want to consider what other people think of the products you’re considering purchasing. Look to see what the real users of the car sun shade think of it by looking through user reviews and the ratings that the product has received. Nobody knows how good or not so good that a product is better than the real people that have actually purchased and used the products. Q: Why should I use a sunshade in my vehicle? There are many reasons why one chooses to use a sunshade in their vehicle. The main, and probably most important, reason is for protection from potential harm from the sun. When the sunlight is consistently radiating in through your vehicles windows, it can cause just as much damage to the skin as it would if you were outside. Many people overlook the simple fact that regular car windows will not protect you from harmful UV rays. Thankfully, all of the sun shade options on our top ten list will help to protect your passengers and some of them even claim to block out up to 98% of those harmful sun rays. It’s important to remember that children’s skin is much more sensitive than an adults, so they are especially susceptible to skin damage, including sun burns, when travelling. Sun shades also will help to eliminate some of the brightness of the sun. Again, an important thing to take into consideration when you have small children in the backseat. Children’s eyes are sensitive and, as a parent, you’ll want to do everything you can to protect them. While nothing beats having a properly fitting pair of sunglasses when it comes to UV protection and eye safety, creating a barrier between those rays and your little one’s eyes with sun shades can play a small part in protecting them against harm. When you install sunshades in your vehicle, you are not only choosing to protect yourself and your passengers from those harmful rays, but you’re also helping to lower the overall ambient temperature of your vehicle. There have been recent studies that have shown that a vehicle in direct sunlight without an installed sun shade can reach up to 192 degrees Farenheit. Imagine climbing into a vehicle that hot or, worse yet, imagine forcing your small children to get into a car with those kinds of temperatures. Everyone will get uncomfortable very, very quickly. With sunshades, however, you can expect those in-vehicle temperatures to be a lot lower, somewhere in the vicinity of about 42 degrees Farenheit cooler according to some studies. Sun shades, then, aid in both protection from the sun and in ensuring everyone in the vehicle stays comfortable for longer. This is especially important for parents of little ones who can’t yet express their discomfort with words. Q: How do the shades attach to my vehicle? This depends entirely on the style that you choose. Some sunshades stick to the window, some require the use of suction cups and some are roller shades that you pull down, similar to the kinds of blinds you might find in your home. Each of these different styles come with their own set of pros and cons. Some people prefer one type over another but you will need to research to find out what you think will work best for you and your family. 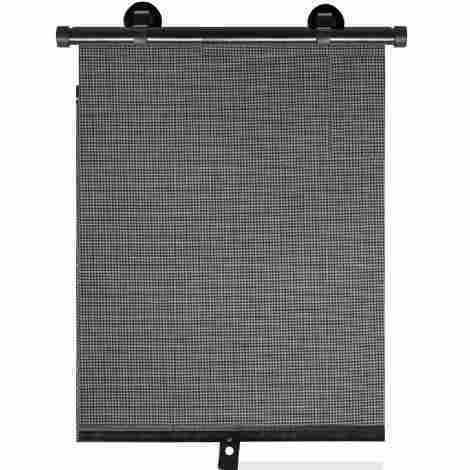 The pull-down sun shades stick to your vehicles window, usually by way of suction cup, and will need to be rolled down to be used. Some people struggle with the suction cups as they can be finicky to operate at times. Another style of sun shade is one that is attached to the window via suction cups but doesn’t need to be rolled down to be put in use. The stick-on sun shades operate like static cling. They stick to the window without needing suction cups. They’re typically easy to remove when not required. Q: How do I know what size sun shade to order? It’s important to do your due diligence here and measure your vehicle windows to find the best fit. Every item on our top ten list includes the dimensions in the product description on Amazon so be sure to read through carefully. If you’re unable to figure out if the sun shades will work in your vehicle, check out the Questions & Answers section on Amazon for each product. This section is very handy for people who are unsure about whether or not the item will work with their vehicle. Many times the manufacturers check the Questions & Answers section and will field your questions themselves. Other times, helpful Amazon customers are there to help you out as best they can. Q: Can I still roll down my window with the sun shade installed? This depends on the type of sun shade you choose to purchase. Some are very thin and will attach to the window like a vinyl sticker, allowing you to still operate the window without having to first uninstall the sun shade. Many shades, however, will need to be uninstalled before the window is able to be operated. With sun shades that are retractable, you can sometimes roll your window down part way without needing to take the shade right off. Again, this is something you may want to do some research on before making your final decision. As you may have learned throughout reading this guide, sun safety is just as important when you’re inside your vehicle as when you’re outside in the direct sunlight. By doing your due diligence and researching what kind of sun shade will work best for both your vehicle and your family’s specific needs, you’re already on the right path. Road & Travel Magazine – Is Your Car An Oven? Cancer.Org – What Is Ultraviolet Radiation?